I’ve heard a lot about Bob Bob Ricard. The restaurant’s savvy owners have hosted a number of blogger events, which have resulted in positive reviews like this one and this one. The place has always sounded like a lot of fun, and the Russian-British comfort food menu, intriguing. However, much as I longed to test out that famous “press for champagne” button, the stars never aligned for me to pay BBR a visit. Last Sunday night, at a loss for where to meet friends for dinner (it turns out that finding a desirable London restaurant open on a Sunday night is only marginally easier than it is in Paris), I was happy to see that Bob Bob Ricard was open for business. So off we went. High points of the evening (other than catching up with friends, obviously)? (1) super attentive service; (2) glitzy OTT decor and private booths; (3) the huge and reasonably-priced wine list; and (4) the meat pelmeni (photo above) and potato vareniki (£12.50). Juicy beef-and-lamb meat inside a thick doughy skin (the meat pelmeni) were well complemented by the tang of vinegar, and the creamy potato vareniki (like a spherical pierogi) was similarly well matched with sour cream. Both were better than any of the pelmeni/dumplings I had in Russia two years ago, though they cost about 12x more than in Moscow and St. Petersburg, so I’d expect no less. 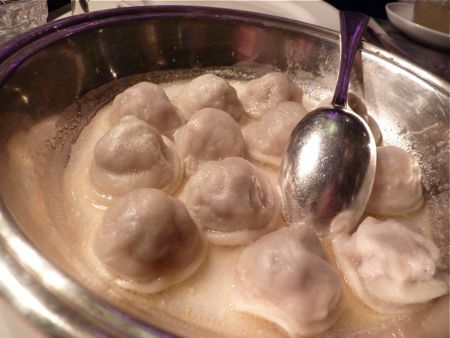 The dumplings made a great starter for four to share. BBR’s menu is an interesting mix of Russian and British comfort food (the latter having a retro slant). 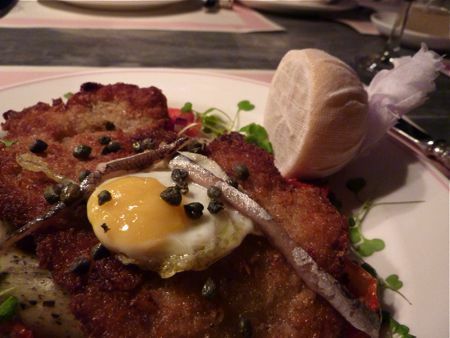 I’d heard much about BBR’s veal holstein, which is theoretically a veal escalope, pounded, breaded and fried, and then topped with a fried egg and anchovies. That’s exactly what I got, except the veal had been pounded a little too thin, I thought. So the breading-to-meat ratio was a bit too high. The truffled mashed potatoes underneath the veal holstein arrived lukewarm, and so much as I love the buttery-cream decadence of a mash, it was hard to enjoy the decadence when it had cooled and congealed somewhat. My friend’s beef onglet was over-sauced, as if the kitchen were worried this cut of meat wouldn’t be flavorful enough on its own. Jon’s chicken kiev (£18.50) was the best of the mains we ordered – juicy and comforting, with plenty of parsley butter oozing out. Side dishes were generally so-so: truffled mash (£5.50) was lukewarm like the pile under my veal holstein; spinach (£4.25) was buttery and hot, so that was alright; and macaroni-and-cheese (£5.50) was hot and delightful, though the purist in me objects to the inclusion of a gooey mozzarella-like cheese in the sauce. Portions at BBR were generous, so I was the only one of our group who was up for dessert. The lemon pot was a refreshing and deceptively-light-tasting choice. The lemon custard and raspberry compote are a classic pairing, and the pastry “soldiers” were a great texture and handy for dipping into the custard. Simple and fun. With a cocktail each (£8.50 each), a £43 bottle of wine, our tab came to £60 each. We had a fab time at BBR, but £60 seemed a lot for what came down to really good meat and potato dumplings in a glitzy dining room. I’d go back to BBR to sample more of their wine list and to sample more of their starters and desserts, but I’d give the mains and side dishes a pass. To read a few other blog posts about BBR, click here to read this positive review (March 2010) by Londonelicious, and here’s a negative review (August 2010) by A Girl Has to Eat. To read more about my May 2008 adventures in Moscow and St. Petersburg, click here. To read about Bocca di Lupo, one of my favorite restaurants nearby in Soho, click here. I really loved the dumplings, interestingly the potato ones more so than the meat. I agree, it’s easy to blow a LOT of cash on not very much. I wonder if the chef was having a bad day as the onglet I had at BBR was excellent – I’ve eaten there a few times now, and it’s always been good. On prices, I agree the bill somehow always stacks up although when I look at each item they seem fairly reasonably priced – but then I tend to order shots of vodka and things I wouldn’t normally have with my meal elsewhere! I will never go to this place again. I thought that their lobster spaghetti was poorly done and outrageously priced. Thanks for sharing! The novelty factor of the ‘press for champagne’ button alone is going to get me there…. @Lizzie – Based on the fact that our pelmeni and drinks were the best part of our experience at BBR, zakusi (starters, yes?) do sound promising. In Russia, for what it’s worth, I remember zakusi being a pretty simple affair – lots of cucumbers and tomatoes, oddly. Though blinis and caviar blinged it up, I suppose. 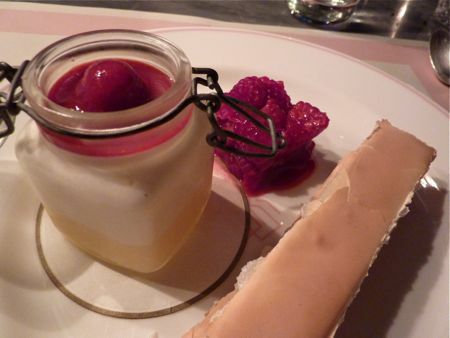 @Greedy Diva – How often have you eaten at BBR? I couldn’t find your post on it. I didn’t think our mains were reasonably priced, actually, even if they had been perfect. Chicken kiev for £18.50? But it’s not the pricing that bothered me as much as silly things like lukewarm mashed potatoes. @Su-Lin – Yup, I’d agree with that statement. @AGirlHastoEat – It sounds like your experience was down to more than the food (i.e., your back-and-forth with the restaurant sounded painful). My memorable “where’s the lobster” moment was the second or third time I ordered the “chop chop salad” at Bar Bar Boulud. I stopped going after that (thought partly bc the resto removed that salad altogether from its menu). @Tori – That button does seem to garner a lot of PR and excitement for the place. Genius marketing. Shame your potatos were not up to scratch. I have been to BBR a couple of times now and did realise what good value we had with the set menu for the bloggers dinner once I had to pay the full menu price. Still for the champagne button alone I love the restaurant and also the really interesting food. Remembering your Russian posts I think you would agree with me that the Russian food at BBR is actually much better than the food in Russia itself! I love this place and have written a glowing review – but have not been invited to eat there as a result 😦 I obviously need to up my game!